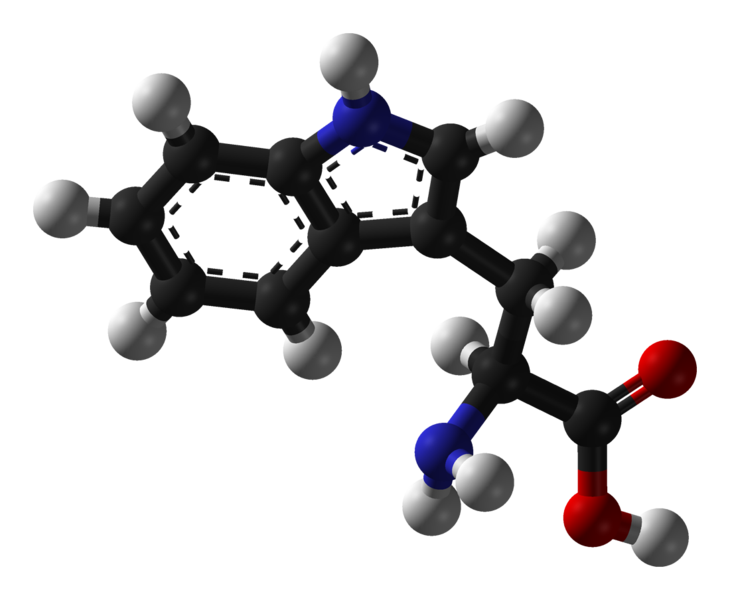 Tryptophan (Try or W) is an amino acid present in proteins. Like all of the amino acids, tryptophan is formed from a COOH group and an NH2group which are involved in peptide bonds. Its side chain is a heterocytic indole. It is an aromatic, apolar, hydrophobic amino acid. Tryptophan is an essential amino acid which is not produced by the body and must therefore be provided in the diet (white cheese, poultry, meat, fish, cereals). In addition to being incorporated into protein chains, tryptophan is the precursor of other important compounds such as serotonin, melatonin, and bufotenin.